Author’s Note: I recognise that my update schedule has been somewhat disrupted in the last month. I wasn’t even especially busy, but I lacked motivation and sufficient material for a post. This post is itself blatant filler, but indicates what I’ve been up to recently. When I get back to my technical interests, I do intend to return to my usual update schedule. I have rarely sought to limit myself to a small range of interests. Aside from the obvious technological, scientific and mechanical pursuits that I regularly talk about on this site, I have also taken forays into subjects rather more diverse, such as politics and history, literature, cinema and art. One subject which I have perpetually taken an interest in is militaria, from the weaponry and equipment used by soldiers to the tactics used to win a war. One of the most important aspects of successfully fighting a war, and one often glossed over by many media sources, is logistics; namely, making sure that your army has sufficient supplies to sustain itself, to fight and to manoeuvre. Theatres of war have been won or lost over logistics, the most famous examples being Napoleon’s invasion of Russia crashing to a halt as the Russian scorched earth strategy worked to deny La Grande Armée the resources of its conquered lands, and the subsequent invasion of the Soviet Union during the Second World War by the German military which was halted at Leningrad, Stalingrad and Moscow by similar scorched-earth tactics. In a modern combined-arms military, logistics is crucial to ensure that all of the components of an army can move in concord. That doesn’t mean that logistics wasn’t important in the past, and one of the most critical parts of logistics now and in the past is ensuring that all personnel have enough food. As has often been expressed, “an army marches on its stomach”. However, military operations come with their own particular set of challenges when it comes to providing food. One of the chief challenges is food preservation, problems arising from matters such as the general deficiency of refrigeration in a modern army and the complete lack of refrigeration in the past, to the conditions that an army may be fighting in, such as fly-infested swamps and humid jungles. Correspondingly, military rations often have to be designed with these limitations and challenges in mind. A type of military ration which persisted for many centuries up until the modern day was hardtack, a type of hard-baked biscuit or cracker designed to be extremely resistant to spoiling and resistant to breakage. Unfortunately, the very steps taken to ensure that the hardtack crackers resisted spoiling also made them unappetising and difficult to eat, especially when eaten for long periods of time, as was regularly the case before modern ration design starting with the C-rations of the United States during the Second World War and continuing today with the MRE (Meal, Ready to Eat) rations of the present-day United States military. I was interested in seeing what these hardtack biscuits would actually taste like, and so I decided to bake a batch of them. The recipe that I used dates back to the American Civil War, although similar rations were reportedly in use with the British Expeditionary Force in the First World War and beyond. The recipe is extraordinarily simple, consisting of nothing else but flour, water and a small addition of salt for flavour. The simplicity of the recipe might have itself contributed to the popularity of hardtack with logisticians of the past; it is very easy to scale up the production of hardtack, even without machine tools or anything more sophisticated than a good oven and a few simple kitchen utensils. 1) Preheat the oven at a temperature of 180°C/350°F. 2) Add the water and salt to a bowl. 3) Add the flour in small quantities, stirring the flour into the water-salt mixture. As the flour is added, a thick paste will be produced. Keep adding flour until you cannot stir the mixture any more. 4) Knead the paste, which should be slightly sticky to the touch. If the mixture continues to be sticky after kneading, add more flour until you have an elastic, but smooth mixture remaining in the bowl. 5) Place the mixture onto a flat surface and roll out into a flat sheet approximately 1cm/½in thick. 7) Place the squares on an ungreased cookie sheet. Place into the oven and bake for 30 minutes. Flip the squares over and bake for another 30 minutes. 8) [OPTIONAL] For enhanced preservation, continue to bake squares at 120°C/250°F for an additional 30 minutes. The picture below shows two batches of hardtack that resulted from this recipe. 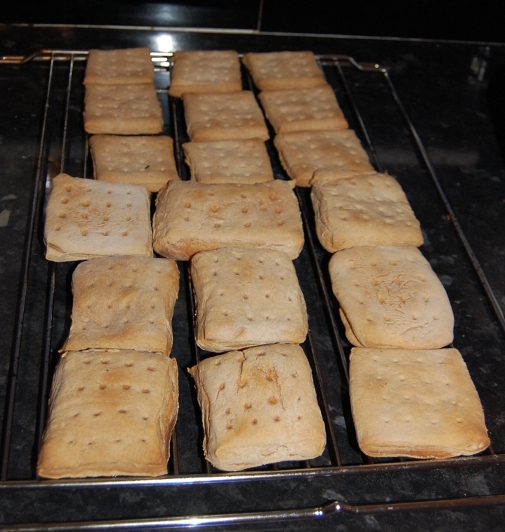 The front nine biscuits were a preliminary first batch, which as can be seen are rather uneven in size and thickness. Most of these biscuits were too thick, and the result was that while the external shell of the biscuits was as it should have been, their centres more closely resembled a bread roll like a baguette; this may well be more appetising than the harder shell, but would be less inclined towards proper preservation, as fungal moulds could thrive on the moisture still contained in the mixture. The back nine biscuits, on the other hand, were more evenly sized, had the proper thickness and altogether more closely resembled what hardtack was meant to be like than the first batch. The most obvious characteristic of the second batch was that the purported hardness of the recipe was not exaggerated by the sources I had used. A soldier with poor dentition would find it difficult, if not impossible, to eat a hardtack biscuit without resorting to things such as leaving them to soak in water or coffee, a process which would itself take quite some time, as the hard shell resists water penetration to the slightly softer core. It is also extraordinarily dangerous to attempt to eat hardtack with one’s incisors; using the premolars or molars is suggested. Once I got past the preliminary difficulty of actually eating the hardtack, I did notice that the flavour wasn’t unpleasant. It tasted like a water cracker, except with a harder outer shell, and would be a sufficient and not-unpleasant sort of food for a short period, such as a modern-day hike. It is, however, a monotonous sort of food, which would be rather less pleasant over the weeks that a soldier of the First World War or American Civil War, for instance, may be forced to eat it, let alone the consistency that would be expected on a naval journey during the time of Admiral Nelson. As survival food for somebody conducting a short activity outdoors, it would be sufficient even today, but as food for a working soldier, well, let’s just say that I’d take an MRE or its equivalent any day of the week!